Overview: Viking Gods is a game of 5 reels, 3 rows, 15 lines. 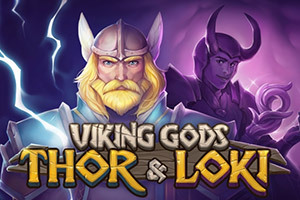 Features: ‘Thor’ Free Spins, ‘Loki’ Free Spins, Colossal Wild symbol, Sticky Wild symbol, Bonus symbols, Viking Gods feature, Achievements to Bonus free spins! 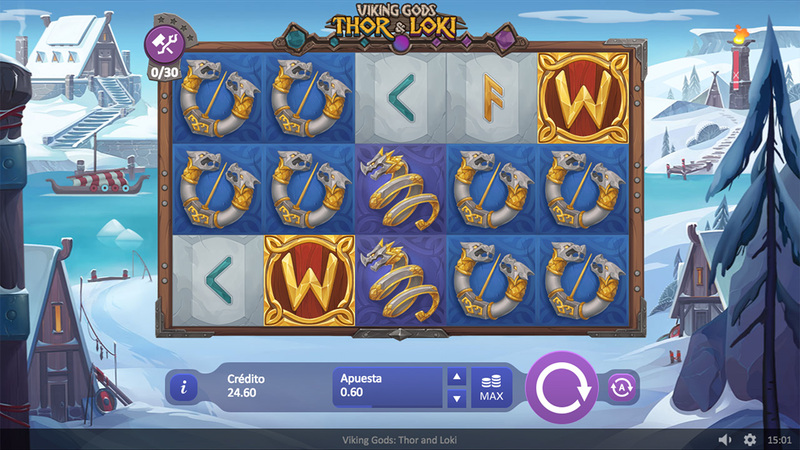 Feel the power of Old Norse Gods in the new 3x5 video slot ‘Viking Gods: Thor and Loki. In the Main Game, gods will present you with Wild symbols for Big Wins. Full stack Bonus symbols will trigger one of two types of Free Spins modes. In one Thor will battle the World Serpent, which will grow to Colossal Wild. And in the other Loki is about to lock the Fenrir Sticky Wild symbols on the reels. And don`t forget to aim for completion of all the achievements to get Bonus Free Spins! There are still many more treasures to find in the North, but you can take the first step by playing ‘Viking Gods: Thor and Loki’ slot! Wild symbols substitute all symbols. Thor Bonus and Loki Bonus are stacked Wild symbols 3x1, which appear only on the 3rd reel during the Main Game. Full stack Thor Bonus and Loki Bonus symbols on the 3rd reel trigger 10 'Thor' or 'Loki' Free Spins. During the Main Game appearance of the Bonus, symbol triggers the Viking Gods feature. 1x1 size Bonus symbol lands 2 Wild symbols on the 2 leftmost reels. 2x1 size Bonus symbol lands 4 Wild symbols on the reels. Thor Bonus symbol lands Wild symbols in stacks on the reels. Loki Bonus symbol lands Wild symbol randomly on the reels.